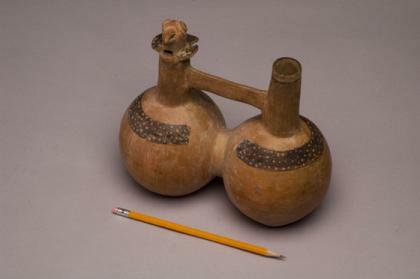 This Peruvian vessel consists of two bottles joined at the chambers, with a bridge, possibly used as a handle, between the necks. A whistle shaped like a parrot rests on one of the spouts. When liquid is poured into or out of the vessel, it forces air through the other spout, sounding the whistle. Whistling vessels may have been sounded by actually blowing into the spout, which creates a much richer tone. While most whistling vessels had two chambers, some had as many as six. In some cultures, the whistling bottles were encased inside a fully-formed effigy figure.